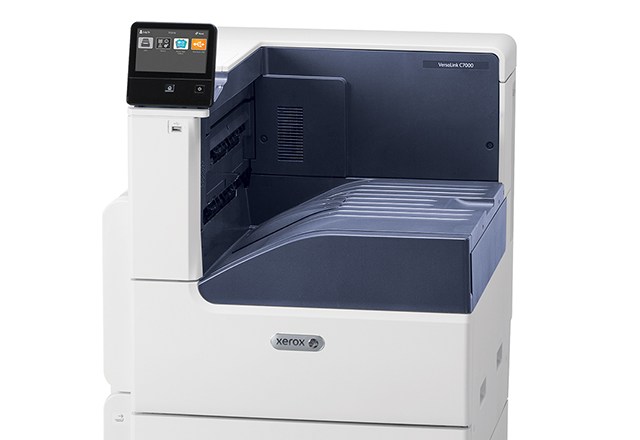 The Xerox VersaLink C7000DN is the answer to offices that need not only high productivity levels from their printer but also high-quality results and a modern approach to connectivity. It’s no longer enough for printers to offer network connectivity, but luckily Xerox had the 21st-century workplace in mind when designing the Xerox VersaLink C7000DN. It offers not only Ethernet and USB connections, but also NFC and mobile printing. The inclusion of Xerox’s ConnectKey technology also means that the Xerox VersaLink C7000DN features extra security features and what Xerox describe as a smart workplace assistant. The Xerox VersaLink C7000DN has measurements of roughly 590 x 670.8 x 637mm and weighs approximately 54.3kg. This colour LED laser printer features an off-white and petrol-blue colour scheme that is bound to fit in with almost any office décor choices. It has a 5-inch LCD colour touchscreen in place of the traditional display screen and control panel. This modern move makes using the printer even more intuitive, and the interface itself should feel very familiar to anyone familiar with using a smartphone or tablet. The list of advantages for the Xerox C7000DN is long. With print speeds of up to 35ppm in both colour and black and white, a first-page print speed of 5.2 seconds and automatic duplex printing standard, this printer puts speed and productivity first. The print resolution is also up to 1,200 x 2,400dpi, which ensures high-quality prints every time, while the 520-sheet input tray and 100-sheet bypass tray keeps things moving by not needing to constantly add more paper to the tray. Thanks to its great connectivity features, this printer also supports mobile printing in several ways and is compatible with Apple AirPrint, Google Cloud Print, Google Drive, OneDrive, Dropbox and Xerox Print. Although this printer is part of Xerox’s VersaLink line of printers that are designed for smaller and medium-sized workspaces, the price point and size of the Xerox C7000DN might have smaller organisations looking elsewhere.